This Retail Client Agreement, together with any Schedule(s), and accompanying documents, as amended from time to time, (hereafter the “Agreement”) sets out the terms of the contract between you, the Customer (also referred as the “Client”) and us, the Company. By signing this agreement, it is assured that you have read, understand and agree with all the terms of this Agreement. “Account” means the trading account you hold with us and designated with a unique account number. 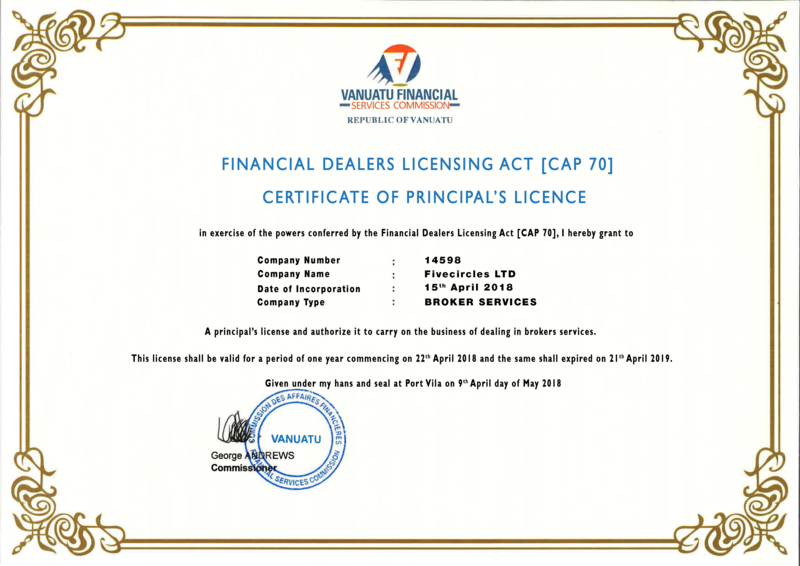 “Applicable Regulations” means the Laws of Vanuatu relating to Regulated Investment Services and Activities, the Anti Money Laundering and Terrorist Financing Act and other Laws, issued by VFSC that govern the operations of Vanuatu regulated Investment Firms or any other rules of a relevant regulatory authority; and all other applicable laws, rules and regulations as in force from time to time. “Associate” means an undertaking in the same group as us, a representative whom we or an undertaking in the same group as us appoint, or any other person with whom we have a relationship that might reasonably be expected to give rise to a community of interest between us and them. “Base Currency” means US Dollars. “Balance” means the sum held on behalf of the Customer on its Account within any period of time. “Bank Account Details” means the details of your bank account in which Fivecircles Limited will credit the amount of profits withdrawn and/or any amount from a withdrawal request and/ or any funds remaining in your trading account and/ or any other amount of funds need to be returned to you. “Business Day” means a day which is not a Saturday or a Sunday or a public holiday in Vanuatu and upon which banks are open for business in Vanuatu. “Client Funds Rules” means the rules specified under the Laws of the VFSC. “Contract for Differences” or “CFD” means the financial instrument between an investor Fivecircles Limited. At the end of the contract, the parties exchange the difference between the opening and closing prices of a specified financial instrument, including shares or commodities. “Credit Support Provider” means any person who has entered into any guarantee, hypothecation, agreement, margin or security agreement in our favour in respect of your obligations under this Agreement. “VFSC” is an abbreviation for the ¨Vanuatu Financial Services Commission¨. “Electronic Services” means a service provided by us, for example an Internet trading service offering clients access to information and trading facilities, via an internet service, a WAP service and/or an electronic order routing system. “Event of Default” means any of the events of default as listed in Clause 15.1 to Clause 15.9 of Clause 14.1 (Events of Default). “Execution” means the completion of clients’ orders on the Company’s trading platform, where the Company acts as the Execution Venue to clients’ transactions. viii.Derivative instruments for the transfer of credit risk. “FX Contract” means a contract between Fivecircles Limited and its Client to exchange two currencies at an agreed exchange rate. “Order” means the request / instruction given by the Customer to the Company in the Customer’s Account. “OTC” means ‘over the counter’ and refers to transactions conducted otherwise than on an exchange. “Fivecircles Limited Trading Desk” means the trading desk operated by us at our premises the Headquarters of Fivecircles Limited S.I.P. Building, P.O. Box 3010, Rue Pasteur, Port Vila, Vanuatu. “Fivecircles Limited Online Trading System” means the internet-based trading system available at our website that allows you to provide us with instructions. “Secured Obligations” means the net obligation owed by you to us after the application of set-off under clause 13 (Clients Funds) in the paragraph entitled (Set-off on default). “Services” means the investment services which will be provided by the Company to the customers and are governed by this Agreement as these are described herein. “System” means all computer hardware and software, equipment, network facilities and other resources and facilities needed to enable you to use an Electronic Service. “Transaction” means any type of transaction subject to this Agreement and includes a CFD, spot or forward contract of any kind, future, option or other derivative contract in relation to any commodity, financial instrument (including any security), currency, interest rate, index or any combination thereof and any other transaction or financial instrument for which we are authorized from time to time which we both agree shall be a Transaction. The relationship between the Customer and Fivecircles Limited shall be governed by this Agreement. In the event where you, the Customer, wish to have a signed Agreement, the Customer should print and send 2 (two) copies to FivecirclesLimited, where Fivecircles Limited= will sign and stamp the Agreements and send a copy back to the Customer. We reserve the right to change this Agreement at any time and notify you of any such change either via email or through Fivecircles Limited website. Any changes to the Agreement will not apply to transactions performed prior to the date on which the changes become effective unless specifically agreed otherwise. In case you disagree with the changes, you may terminate the Agreement in accordance with Clause 18 herein. We, Fivecircles Limited (“Fivecircles Limited are authorised and regulated by the Vanuatu Financial Services Commission (“VFSC”) with License Number 17921 Our registered office is S.I.P. Building, P.O. Box 3010, Rue Pasteur, Port Vila, Vanuatu. Our contact details are set out in Clause 19 (Miscellaneous) under the heading “Notices”. Fivecircles Limited is a broker for CFD and Spot FX Contracts. Fivecircles Limited operates websites, trading platforms and brand names as indicated in its website (http://five-circles.com/) Fivecircles Limited operates through these websites which allow online trading. You may communicate with us in writing (including fax), by email or other electronic means, or orally (including by telephone). Our contact details are set out in Clause 19 (Miscellaneous) under the heading “Notices”. The language of communication shall be English, and you will receive documents and other information from us in English. However, where appropriate and for your convenience, we will endeavor to communicate with you in other languages. Our website contains further details about us and our services, and other information relevant to this Agreement. In the event of any conflict between the terms of this Agreement and our website this Agreement will prevail. Fivecircles Limited monitors your communications to evaluate the quality of service you receive, your compliance with this Agreement, the security of the website, or for other reasons. You agree that such monitoring activities will not entitle you to any cause of action or other right with respect to the manner in which Fivecircles Limited monitors your communications. The list of banned countries, is subject to alteration at any time the Company deems proper upon its sole discretion without any prior notice. A reference in this Agreement to a “clause” or “Schedule” shall be construed as a reference to, respectively, a clause or Schedule of this Agreement, unless the context requires otherwise. References in this Agreement to any statute or statutory instrument or Applicable Regulations include any modification, amendment, extension or re-enactment thereof. A reference in this Agreement to “document” shall be construed to include any electronic document. The masculine includes the feminine and the neuter and the singular includes the plural and vice versa as the context admits or requires. Words and phrases defined in the VFSC’s Rules and the Applicable Regulations have the same meaning in this Agreement unless expressly defined in this Agreement. You should be aware of the possibility that other taxes or costs may exist that are not paid through or imposed by us. In case of any value added tax or any other tax obligations that arise in relation a transaction performed on your behalf or any other action performed under this Agreement for you, the amount incurred is fully payable by you and in this respect you must pay Fivecircles Limited when so requested and Fivecircles Limited is fully entitled to debit your account with the outstanding amount to be settled (excluding taxes payable by Fivecircles Limited in relation to Fivecircles Limited s income or profits). A daily financing charge may apply to each FX/CFD open position at the closing of Fivecircles Limited’s trading day as regard to that FX/CFD. If such financing charge is applicable, it will either be requested to be paid by Client directly to Fivecircles Limited’s or it will be paid by Fivecircles Limited’s to Client, depending on the type of FX/CFD and the nature of the position Client holds. The method of calculation of the financing charge varies according to the type of FX/CFD to which it applies. Moreover, the amount of the financing charge will vary as it is linked to current interest rates (such as LIBOR). The financing charge will be credited or debited (as appropriate) to Client’s account on the next trading day following the day to which it relates. Fivecircles Limited’s reserves the right to change the method of calculating the financing charge, the financing rates and/or the types of FX/CFDs to which the financing charge applies. For certain types of FX/CFDs, a commission is payable by Client to open and close FX/CFD positions. Such commission payable will be debited from Client’s account at the same time as Fivecircles Limited’s opens or closes the relevant FX/CFD. Changes in our swap interest rates and calculations shall be at our own discretion and without notice. Clients need to always check our website for the then current rates charged. Rates may change quickly due to market conditions (changes in interest rates, volatility, liquidity etc.) and due to various risk related matters that are at the firm’s sole discretion. The future contract on which a CFD is based has an expiration date, and clients will be able to close their CFD positions until this date. In order to insure continuous trading conditions for the client, when a future contract that a CFD is based on reaches its maturity, the underlying asset of that CFD will be switched to the next maturity of the same futures contract. A calendar of such rollovers is mentioned on the company’s website, section “Documentation/Standard Specifications”. For the best interest of the client, rollovers will also be notified in the “Internal news” section of the website, at least 5 hours prior to the rollover. A premium will be either added or subtracted from the client’s account, based on the difference in prices between the two futures contracts. Any open FX/CFD transaction held by Client at the end of the trading day as determined by Fivecircles Limited or over the weekend, shall automatically be rolled over to the next business day so as to avoid an automatic close and physical settlement of the transaction. Client acknowledges that when rolling over such transactions to the next business day, a premium may be either added or subtracted from Client’s account with respect to such transaction. The MT4 platform calculates overnight rollover at 21:00 GMT and the rollover charge/credit is debited or credited to and from the trading account. Example: If you sell 1 lot EURUSD, you will pay rollover costs on 100.000 Euro, which at the current rate would be $0.017. This rate may vary over time, for actual rates please check the “Standard specifications” on our website. On Wednesday at 21:00 GMT, overnight rollover fees are multiplied by three (x3) in order to compensate for the upcoming weekend. The premium amount shall be determined by Fivecircles Limited from time to time, in Fivecircles Limited’s absolute discretion. Client hereby authorizes Fivecircles Limited to add or subtract the premium to or from Client ’s account for any open transaction that have accrued a premium, in accordance with the applicable rate thereto, each day at the time of collection specified on the trading platform for each individual instrument, as applicable. You have a right to cancel this Agreement within a period of fourteen days commencing on the date on which this Agreement is concluded or the date on which you receive this Agreement (whichever is later) (the “Cancellation Period”). Should you wish to cancel this Agreement within the Cancellation Period, you should send a notice in writing to the following address: Fivecircles Limited, S.I.P. Building, P.O. Box 3010, Rue Pasteur, Port Vila, Vanuatu, or electronically to the following email address: support@fgmarkets.com. Cancelling this Agreement within the Cancellation Period will not cancel any Transaction entered into by you during the Cancellation Period. If you fail to cancel this Agreement within the Cancellation Period you will be bound by its terms but you may terminate this Agreement in accordance with clause 18 (Termination without Default). Fivecircles Limited deals on an execution only basis and do not advise on the merits of particular Transactions, or their taxation consequences. You assume all responsibility in relation to any investment strategy, transaction or investment, tax costs, and for any consequences brought by from any transaction that you perform and Fivecircles Limited shall not be held responsible nor you shall rely on the Company for the aforementioned. Under Applicable Regulations, Fivecircles Limited is required to have arrangements in place to manage conflicts of interest between Fivecircles Limited and its Customers and between other Customers. In this respect, Fivecircles Limited will make all reasonable efforts to avoid conflicts of interest; when they cannot be avoided Fivecircles Limited shall ensure that you are treated fairly and at the highest level of integrity and that your interests are protected at all times. You acknowledge and accept that you have read and accepted the Conflict of Interest Policy, which was provided to you during the registration process and is uploaded on Fivecircles Limited’s official website. The Client acknowledges and accepts that the Company reserves the right, upon written notice, to freeze any trading account by virtue of any legal and/or regulatory requirements. When you register for the Services, Fivecircles Limited will ask you to provide certain identifying information, as part of the account opening procedure that will allow us to identify you and categorise you according to the “Client Classification Policy” of Fivecircles Limited. You are requested to provide your bank account details prior to the opening of your trading account in order for Fivecircles Limited to be able to return any funds relating to your trading account. Before you can place an order with Fivecircles Limited, you must read and accept this Agreement, including the risk disclosure statement, the trading policies and procedures as listed in clause 9 below, and all applicable addenda, you must deposit sufficient funds in your account and your customer registration form and all accompanying documents must be approved by Fivecircles Limited. Upon the approval of your registration, you will be notified by e-mail. Fivecircles Limited may, in its sole discretion, request that in addition to online acceptance of this Agreement, Customer must complete and submit any signed documents so required by Fivecircles Limited, including but not limited to this Agreement and risk disclosure statement. You will be able to open your trading Account(s) in USD, EUR, GBP- or any currency that may be offered by Fivecircles Limited. Account(s) balances will be calculated and reported to you in the currency in which Account(s) are maintained. In addition to the conditions listed in Clause 9 in the paragraph entitled “Authority” with regards to joint Account holders, the following additional conditions apply. 1. Each joint Account holder will be jointly and severally liable for all obligations to Fivecircles Limited arising in respect of your joint trading Account. 7. Each of you will be given sole access to the funds initially deposited by you in your joint trading Account. Should you wish to withdraw these funds from your trading Account, you will be required to complete and sign a withdrawal form or an electronic withdrawal form, upon receipt of the completed withdrawal form you will be granted permission by Fivecircles Limited to withdraw funds up to the amount of available account balance, provided that the conditions for withdrawals stipulated in clause 9 are satisfied. Fivecircles Limited will credit the amount withdrawn in the same bank account, credit/debit card or other payment method from where it was originally debited. 8. In the case of withdrawal from joint trading accounts, if any of the account beneficiaries wishes to withdraw funds from the joint trading Account, you will be required to complete and sign a withdrawal form or an electronic withdrawal form, provided that the conditions for withdrawals stipulated in clause 9 are satisfied. Upon receipt of the completed withdrawal form you will be granted permission by Fivecircles Limited to withdraw any funds from the joint trading Account. Fivecircles Limited will credit the amount of funds withdrawn in the same bank account, credit/debit card or other payment method from where it was originally debited. In the event of a customer who due to its observance of Islamic religious beliefs cannot receive or pay interest, such customer may elect to designate, in the manner provided by the Company as this may be altered from time to time, their trading account to be a swap-free account not charged with or entitled to, premiums and/or rollovers and/or interest (“Islamic Account”). The customer hereby confirms and/or accepts and/or declares that a request to render their account as Islamic shall only be made due to the said Islamic religious beliefs and for no other reason whatsoever. The Company reserves the right to refuse accepting the request of a customer to designate their account as an Islamic Account, upon its sole and absolute discretion which shall be conclusive and undisputable upon the customer. FGMarkets promotes a Bonus Offer (the “Bonus” or “Offer”) to its Clients, subject to the terms and conditions contained in the present document. By opening a trading account and applying for this Offer, the Client acknowledges that he has read and agreed to be bound by these terms and conditions and the FGMarkets Trading Terms and Conditions which are available on this website. This Offer is available only for Clients who opened an account through www.FGMarkets.com FGMarkets reserves the right at its discretion to discontinue offering the Bonus for any country and/or regions as it deems necessary. 4.7 the Client must not be associated with any person who has participated in Abusive Behavior (as defined in paragraph 5 below) in relation to any other offer or promotion made by FGMarkets. 5.2 the Client does not participate in any abuse, improper conduct, or attempted abuse or improper conduct in relation to this Offer or, in either case, any previous abuse or improper conduct in relation to a previous similar Offer or promotion by the Client (together, “Abusive Behavior”). Subject to FGMarkets’s Trading Terms and Conditions and the present Offer’s Terms and Conditions each Client other than a Client excluded in accordance with paragraph 3 above or who does not satisfy the conditions in paragraph 5 above (an “eligible client”) will be entitled to receive a bonus. The Offer shall apply on a per-Client basis and shall in no way be affected by the number of accounts which a Client holds with FGMarkets. THE BONUS CANNOT BE CASHED IN and Clients will not be allowed to withdraw from their account the Bonus (see paragraph 13 for further details). The eligible client’s account subject to this Offer will not be eligible to participate in this Offer again in the following months. In addition, the Client acknowledges that no internal transfers of the Bonus will be allowed between the eligible client’s accounts with FGMarkets. The use of Expert Advisors and/or any other plug in system will disqualify this Offer. Once all of the requirements set out in these terms and conditions have been met, the Bonus will be credited into the eligible Client’s account as a notional sum. The Bonus will not be recorded or construed as a liability of FGMarkets towards the Client and may be unilaterally, retroactively and unconditionally withheld, subtracted, cancelled or removed from a Client’s accounts, at any time and at the sole discretion of FGMarkets in accordance with the terms set out in paragraph 19 below. In order to activate and claim the Bonus offered under this promotion, the Client should set up an account with FGMarkets, send a request via his account manager. Following receipt of the Bonus, the Client is eligible to request a withdrawal of funds from his account upon the completion of 1 turn lot per 10 USD bonus withdrawal. Trades only on Forex, Commodities and Indices will be considered. (Any trade on Shares/Stocks will be excluded). The number of lots traded and of round turn trades realized can be verified by Account history tab in MT4 terminal. Client needs to trade whole total bonus amount he has on the account in order to request withdrawal. 11.1. Prior to the fulfilment of such request, at its sole discretion, remove from the Client’s account a sum which equals the Bonus previously granted. If there are insufficient funds in the Client’s account to enable the removal of a sum equaling the Bonus, FGMarkets shall be entitled to remove all sums in the account. 13 above, such action shall not give rise to any cause of action, liability or remedy against FGMarkets. The Client acknowledges that Forex and CFDs are leveraged products which involve a high level of risk. When trading in such products, the Client understands that it is possible to lose all of his capital. These products may not be suitable for everyone and the Client should ensure that he understands the risks involved. The Client should seek independent advice if necessary. The Client is only entitled to receive the Bonus once (regardless of the number of accounts he maintains). This Offer is independent and, save as set out in paragraph 4 above, does not affect any promotions previously offered by FGMarkets. Clients should contact their account managers if they have any questions (or wish to make requests) in relation to this Offer or previous promotions. If FGMarkets in good faith has reason to believe that a Client (whether individually or as part of a group) has failed to comply with the conditions set out in paragraph 5 above, FGMarkets is entitled at its sole discretion, to: (i) deny, withhold or withdraw from that Client the Bonus (ii) to withhold, cancel and subtract, from that Client’s account(s) and/or from any other account(s) related to such Client account(s) the Bonus, (iii) to offset any resulting losses against related/hedged winning accounts, (iv) to terminate that Client’s access to services provided by FGMarkets and/or terminate the contract between FGMarkets and the Client for the provision of services, (v) to block that Client’s Account(s) (save where required otherwise by a relevant authority) and to arrange for the transfer of any unused balance (less the Bonus) to the Client and (vi) to cancel any profits, as well as any Introducing Broker’s or affiliates fees, generated from Abusive Behavior. FGMarkets has the right to levy an administration charge on the Client up to the value of the Bonus to cover any costs incurred by FGMarkets in respect of validating or investigating information provided by the Client to FGMarkets or contacting the Client. FGMarkets may ask the Client to provide sufficient documentation as the Company thinks fit and necessary in order be satisfied as to the Client’s identity before granting any bonus. These Terms & Conditions are made in English. Any other language translation is provided as a convenience only. In the case of any inconsistency or discrepancy between the original English text and its translation into any other language, as the case may be, the original version in English shall prevail. You may give us instructions in electronic form through the Fivecircles Limited Online Trading System. If any instructions are received by us by telephone, computer or other medium we may ask you to confirm such instructions in writing. We shall be authorized to follow instructions notwithstanding your failure to confirm them in writing. In this Agreement “instructions” and “orders” have the same meaning. a) Good till Cancelled (“GTC”) – An order (other than a market order), that by its terms is effective until filled or cancelled by Client. GTC Orders are not automatically cancelled at the end of the Business Day on which they are placed. b) Limit – An order (other than a market order) to buy or sell the identified market at a specified price. A limit order to buy generally will be executed when the ask price equals or falls below the bid price that you specify in the limit order. A limit order to sell generally will be executed when the bid price equals or exceeds the ask price that you specify in the limit order. c) Market- An order to buy or sell the identified market at the current market price that Fivecircles Limited provides via the Online Trading System. An order to buy is executed at the current market ask price and an order to sell is executed at the current market bid price. d) One Cancels the Other (“OCO”) – An order that is linked to another order. If one of the orders is executed, the other will be automatically cancelled. e) Stop Loss – A stop loss order is an instruction to buy or sell a market at a price which is worse than the opening price of an open position (or worse than the prevailing price when applying the stop loss order to an already open position). It can be used to help protect against losses. Please note that because of market gapping, the best available price that may be achieved could be materially different to the price set on the stop loss order and as such, stop loss orders are not guaranteed to take effect at the price for which they are set. f) Trailing Stop – A trailing stop is the same as a stop loss order with the only difference being that, instead of setting a price at which the order is activated, the trailing stop order is activated at a fixed distance from the market price. For example, if Client has purchased a long open position and the market ask price increases, the trailing stop price will also increase and will trail behind the market ask price at the fixed distance set by Client. If the market ask price then decreases, the trailing stop price will remain fixed at its last position and if the market ask price reaches the trailing stop price, the order will be executed. Please note that because of market gapping, the best available price that may be achieved could be materially different to the price set on the trailing stop order and as such, trailing stop orders are not guaranteed to take effect at the fixed distance for which they are set. Following submission of an order, it is your sole responsibility to remain available for order and fill confirmations, and other communications regarding your Account until all open orders are completed. Thereafter, you must monitor your Account frequently when you have open positions in the Account. g) Gap – a break between prices that occurs when the price of an asset makes a sharp move up or down with no trading occurring in between. Gaps can be created by a number of factors including regular buying or selling pressure, earning announcements, or any other type of news release. If a market gaps through all orders will be filled on a best efforts basis at first available price (not order level). Unless otherwise specified by Fivecircles Limited, all trades shall be made in United States Dollars (USD). You can place an Order via Fivecircles Limited’s Trading Platform. Once your instructions or Orders are received by Fivecircles Limited, they cannot be revoked, except with Fivecircles Limited’s written consent which may be given at Fivecircles Limited’s sole and absolute discretion. Fivecircles Limited shall have no liability for failure to execute orders. Fivecircles Limited shall have the right, but not the obligation, to reject any order in whole or in part prior to execution, or to cancel any order, where your Account contains funds that are insufficient to support the entire order or where such order is illegal or otherwise improper. Fivecircles Limited may, in certain circumstances accept instructions, by telephone via Fivecircles Limited s Dealing Room, provided that Fivecircles Limited is satisfied, at its full discretion, of your identity and Fivecircles Limited is further also satisfied with the clarity of instructions. In case of an Order received by Fivecircles Limited in any means other than through the Trading Platform, the Order will be transmitted by Fivecircles Limited to the Trading Platform and processed as if it was received through the Trading Platform. It is understood that an Order will not be affected. In the event that Fivecircles Limited wishes to confirm in any manner any instructions and/or Orders and/or communications sent through the telephone, it reserves the right to do so. You accept that there is a risk of misinterpretation or mistakes in the instructions or Orders sent through the telephone, regardless of what caused them, including, among others, technical failures. 1. Price. The relative importance we attach is “high”. 2. Speed. The relative importance we attach is “high”. 3. Likelihood of execution and settlement. The relative importance we attach is “high”. 4. Size. The relative importance we attach is “high”. Orders may be cancelled via the Fivecircles Limited Online Trading System but we can only cancel your instructions if you explicitly request so, provided that we have not acted up to the time of your request upon those instructions. Executed instructions may only be withdrawn or amended by you with our consent. Fivecircles Limited shall have no liability for any claims, losses, damages, costs or expenses, including legal fees, arising directly or indirectly out of the failure of such order to be cancelled. The position limits will be notified in advance to you either through Fivecircles Limited’s website or trading platforms. Clients must be aware that Forex transactions carry a high degree of risk. The amount of initial margin may be small relative to the value of the foreign currency so that transactions are ‘leveraged’ or ‘geared’. A relatively small market movement may have a proportionately larger impact on the funds that the Client has deposited or will have to deposit. This may work against as well as for the client. Fivecircles Limited exclusively reserves the right to widen its variable spreads, adjust leverage, change its rollover rates and/or increase the margin requirements without notice under certain market conditions including, but not limited to, when the trading desk is closed, around fundamental announcements, as a result of changes in credit markets and/or at times of extreme market volatility. In such circumstances, the Client agrees to indemnify Fivecircles Limited for any and all losses that may occur due the widening of spreads and the adjustment of leverage. At the end of each trading day, confirmations for all Transactions that we have executed on your behalf on that trading day will be available via your online Account on our website. It is your responsibility to notify Fivecircles Limited if any confirmations are incorrect. Confirmations shall, in the absence of manifest error, be conclusive and binding on you, unless you place your objection in writing within 5 Business Days. You may request to receive the Account statement monthly or quarterly via email, by providing such a request to Fivecircles Limited, but Fivecircles Limited is not obliged to provide you with the paper Account statement. The Account statement may be provided at the expense of the client. 4. any instance where one or more transactions are judged by Fivecircles Limited to have been performed in violation of this Agreement. 7. coordinated transactions by related parties in order to take advantage of systems errors and delays on systems updates. We reserve the right to cancel any and/or all trading positions and withhold and/or forfeit any profits incurred by the Customer on all the Customer’s trades if we consider that that the Customer has engaged in market Arbitrage. 6. when you deposit $3,000 or more or if you make over 10 separate deposits to your trading Accounts and Fivecircles Limited is unable to verify your credit or debit card details or is unable to verify any other payment method used. Fivecircles Limited’s objective is to provide the most efficient trading liquidity available in the form of streaming, tradable prices for most of the financial instruments we offer on the trading platform. As a result of the highly automated nature of the delivery of these streaming, tradable prices, you acknowledge and accept that price misquotations are likely to occur from time to time. No employee and/or former employee who currently works or used to work on a full time or part time basis for Fivecircles Limited or any of its related entities shall, during the term of the employee and/or former employee’s service to Fivecircles Limited or any of its related entities and after termination of service become a client of any brand of Fivecircles Limited (either directly or indirectly, alone or with partners, associates, affiliates or any other third party) without Fivecircles Limited’s prior written approval. Should Fivecircles Limited consider that the employee and/or former employee is trading with any brand of Fivecircles Limited without the Fivecircles Limited prior written approval personally and/or via a third party we shall consider all the trading to be abusive and/or improper trading. In such circumstances the employee and/or former employee’s trading account(s) and all open positions shall be closed immediately and any funds held within the account shall be confiscated. No business associate or former business associate of Fivecircles Limited or any of its related entities shall, during the period of the agreement between the associate/former business associate and Fivecircles Limited and after termination of such agreement, become a client of any brand of Fivecircles Limited (either directly or indirectly, alone or with partners, associates, affiliates or any other third party) without Fivecircles Limited’s prior written approval. Should Fivecircles Limited consider that the associate/former business associate is trading with any brand of Fivecircles Limited without Fivecircles Limited’s prior written approval personally and/or via a third party we shall consider all the trading to be abusive and/or improper trading. In such circumstances the relevant associate/former business associate’s trading account(s) and all open positions shall be closed immediately and any funds held within the account shall be confiscated. Without prejudice and subject to the terms of this Agreement, all Applicable Regulations and all conditions attaching to any relevant payments made to you under a bonus or rebate scheme operated by us, you may withdraw funds from your Account provided that such funds are not being utilized for margin purposes or have otherwise become owed to us. Once your withdrawal request is approved, your withdrawal request will be processed by us and sent to the same bank, credit card or other source for execution as soon as possible. (Note: Some banks and credit card companies may take time to process payments especially in currencies where a correspondent bank is involved in the transaction). The funds will be returned to the bank account/credit card/other source from which the funds were debited. You are fully responsible for the payment details that you provided to Fivecircles Limited and Fivecircles Limited accepts no responsibility if you have provided false or inaccurate bank details. Further, withdrawals bare third party charges which may vary in accordance with the terms and conditions of the third parties. These charges may be verified upon request. If you request a withdrawal of funds from your Account and we cannot comply with it without closing some part of your open positions, we will not comply with the request until you have closed sufficient positions to allow you to make the withdrawal. In order to process your withdrawal request please ensure that the funds remaining on your account following your withdrawal complies with the Company’s bonus withdrawal policy detailed in section 9 above. If you have not met the necessary bonus trading requirements at the time you make a withdrawal request the bonus will be debited from your trading account. Withdrawals will only be made on request by you, by bank transfer to an account in your name or such other method as we, in our absolute discretion, may determine. Fivecircles Limited reserves the right to decline a withdrawal request if the request is not in accordance with certain conditions mentioned in this Agreement or delay the processing of the request if not satisfied on full documentation provided. Fivecircles Limited will endeavor to process your withdrawal requests promptly, however the time needed for the requested funds to be processed and appear in your account will depend upon the method used for depositing the funds. Payments on Stock Splits, Reverse Stock Splits, Stock Dividends and other Stock related events can have an impact on the share price and thus on the price of an equity based CFD. A person who holds a CFD position has no ownership of the underlying instrument. However, when a client holds a long CFD position, Fivecircles Limited shall pay the equivalent of the dividend to that client and deduct the equivalent from any client holding a short CFD position. This shall be done on or shortly after the ex-dividend date as that is when the economic effect is felt on the underlying share price. If we do not record any activity in your MT4 Trading Account during a continuous period of three (3) months and you have a zero account balance, your MT4 Trading Account and all its history will be archived on our trade server. If you wish to keep using your MT4 Trading Account or restore it in the future, please contact us at support@fgmarkets.com. The Client further acknowledges and confirms that such Inactive Accounts will be subject to a monthly charge of $10 (or equivalent in other currencies), relating to the maintenance/administration of such Inactive Accounts. The Customer further agrees that any Inactive Accounts, holding zero balance/equity, shall be turned to Dormant (“Dormant Account“). Accounts, the Customer must contact Fivecircles Limited’s Customer Support Department and inform them of the Customer’s wish to reactivate the Dormant Account. The Customer’s Dormant Account will then be reactivated (subject to, if required, up-to-date Know Your Customer documentation provided to Fivecircles Limited by Customer) and become an Active Account. Once you have gone through the security procedures associated with an Electronic Service provided by us, you will get access to Fivecircles Limited’s website and/or trading platforms, unless agreed otherwise or stated on our website in order to place orders for any Financial Instrument available from Fivecircles Limited and entering into Transactions with Fivecircles Limited. Further, you will be able to trade on the Fivecircles Limited’s Trading Platforms with and through Fivecircles Limited with the use of a personal computer, smartphone or any other similar device that is connected to the internet. In this respect, you understand that Fivecircles Limited can, at its absolute discretion, terminate your access to Fivecircles Limited’s systems in order to protect both the Company’s and your interests and to ensure the systems’ effectiveness and efficiency. All references to Fivecircles Limited’s hours of trading are in Greenwich Mean Time (“GMT”) using 24-hour format. Our Electronic Services will normally be available continuously from 21:00 GMT Sunday until 21:00 GMT Friday (winter time), every week, excluding public holidays where the Forex market does not operate and cases where the market is closed due to illiquidity in the financial instruments. Please consult our website for more details on operating times for each financial instrument. We reserve the right to suspend or modify the operating hours on our own discretion and on such event our website will be updated without delay in order to inform you accordingly. In this respect the operating hours, as indicated on the websites operated by our company and to which you have trading rights are the applicable. We may change our security procedures at any time and we will inform you of any new procedures that apply to you as soon as possible. In regards to Forex, to enter an online order, you must access the Markets window, then click on “BUY/SELL” for the relevant market. A new window will appear in which you enter the price and lot size. The order is filled shortly after you hit the OK button provided you have sufficient funds in your Account. Orders may fail for several reasons including changing dealer prices, insufficient margin, unspecified lot size or unanticipated technical difficulties. Neither we nor any third party software provider accepts any liability in respect of any delays, inaccuracies, errors or omissions in any data provided to you in connection with an Electronic Service. We shall not be liable for any loss, liability or cost whatsoever arising from any unauthorized use of the Electronic Service. You shall on demand indemnify, protect and hold us harmless from and against all losses, liabilities, judgements, suits, actions, proceedings, claims, damages and costs resulting from or arising out of any act or omission by any person using an Electronic Service by using your designated passwords, whether or not you authorized such use. Each asset has its own trading time, these can be found in the asset index table. On the trader’s page, the trader will be able to see the time “left to expiry” and “time left for trading”. In general “no trading times” can last between 2 minutes to 30 minutes before the expiry time, these times vary from asset to asset, they also vary according to market conditions and the expiry time of each asset and may change as a result of a change in one of the underlying asset base conditions. At least 5 minutes before the “no trading time”, a notification with a countdown clock will appear on the trader’s screen, this countdown clock will counting down the time left to the “no trading time”. These clauses apply to your use of our “One Touch” Service. If the asset reaches the predetermined rate at precisely 17.00 GMT of the same day, the client becomes eligible to receive the payout of up to 500% at the time of the expiration. If, however, the investment is out-of-the-money on any day, the trade will stay open and be checked each day to see if the price has reached the predetermined rate needed for an in-the-money outcome. The trade will remain open until the Friday, at which point the trade expires. The client may purchase One Touch options whenever the market for the given asset is closed. It should be noted that in order for the client to receive the payout, the sample price of the underlying asset needs to reach or surpass the pre-set target rate only once during the option lifetime. In the event that the price of the underlying asset does not reach the predetermined level, the client will not receive any refund and will forfeit the entire amount of the investment. Therefore, the amount of profit or risk in this option is preset and known ahead of time. The option may only be purchased in units, at the price specified on the site. The options will be sampled (checked to verify if they hit the target rates) once a day, at 17.00 GMT, Monday through Friday. Whenever sample rates are not published five times during the week, the number of samples will be reduced accordingly. The predetermined payout will be transferred to the client’s account on the option expiration date, even if the terms of the option have been met prior to the date of expiration. 5. to cease the sale of the options or to offer you a new quote. In the event we offer you a new quote you have the right to either accept it or refuse it and thus cancel the execution of the Transaction. Once the options have been purchased, the trade may not be cancelled at any point prior to the expiration of the option. We treat funds received from you or held by us on your behalf in accordance with the requirements of the relevant regulations. In particular, funds belonging to you that will be used for trading purposes will be kept in an account with any bank or financial institution used to accept funds which Fivecircles Limited will specify from time to time and will be held in Fivecircles Limited s name. By accepting this Agreement, you authorize Fivecircles Limited to make any necessary reconciliation transfers in order for the bank account balance to match the trading account balance, including, without prejudice to the generality of the above, withdrawals for the settlement of all transactions undertaken under the Agreement and all amounts which are payable by or on behalf of the Customer to Fivecircles Limited or any other person. It is understood that any amount payable by Fivecircles Limited to you, shall be paid directly to you to a bank account the beneficial owner of which is you. Fund transfer requests are processed by Fivecircles Limited within the time period specified on Fivecircles Limited’s official website and the time needed for crediting into your personal account will depend on your bank account provider. You agree that any amounts sent by you in the Fivecircles Limited’s bank accounts, will be deposited to your trading account at the value date of the payment received and net of any charges/fees charged by the bank account providers or any other intermediary involved in such transaction process. In order for Fivecircles Limited to accept any deposits by you, the identification of the sender must by verified and ensure that the person depositing the funds is you. If these conditions are not met, Fivecircles Limited reserves the right to refund the net amount deposited via the method used by the depositor. We will endeavor to hold client funds on your behalf within the European Union, however we may also hold your funds in a bank established outside the European Union. The legal and regulatory regime applying to any such bank or person might be different from the legal and regulatory regime in the European Union and in the event of the insolvency or any other analogous proceedings in relation to that bank or person, your funds may be treated differently from the treatment which would apply if the funds was held with a bank in an account in the European Union. We will not be liable for the insolvency, acts or omissions of any third party referred to in this clause. Fivecircles Limited will not be liable for loss suffered by you in connection to your funds held by us, unless such loss directly arises from our gross negligence, willful default or fraud. If there is an Event of Default or this Agreement terminates, we shall set-off the balance of amounts owed by us to you against your obligations (as reasonably valued by us). The net amount, if any, payable between us following such set-off, shall take into account the Liquidation Amount payable under Clause 16 (Netting). You undertake neither to create nor to have outstanding any security interest whatsoever over, nor to agree to assign or transfer, any of the cash transferred to us, except a lien routinely imposed on all securities in a clearing system in which such securities may be held. 10. except as otherwise agreed by us, you are the sole beneficial owner of all funds you transfer under this Agreement, free and clear of any security interest whatsoever other than a lien routinely imposed on all securities in a clearing system in which such securities may be held. That in the event that Fivecircles Limited has such proofs that are adequate to indicate that certain amounts received by you are proceeds from illegal acts or products of any criminal activity and/or belonging to a third party, Fivecircles Limited reserves the right to refund these amounts to the sender, either this being you or a beneficial owner of a legal entity. Furthermore, you also agree and understand that Fivecircles Limited may reverse any Transactions performed in your Trading Account and may terminate this agreement. Fivecircles Limited at the discretion of its compliance officer may report any suspicious transactions to the relevant authorities. Fivecircles Limited reserves the right to take any legal action against you to cover and indemnify itself upon such an event and may claim any damages caused to Fivecircles Limited by you as a result of such an event. On the occurrence of an Event of Default, we may exercise our rights under this clause, except that in the case of the occurrence of any Event of Default specified in Clause 15.2 or Clause 15.3 of the definition of Events of Default (each a “Bankruptcy Default”), the automatic termination provision of this clause shall apply. Subject to the following sub-clause, at any time following the occurrence of an Event of Default, we may, by notice to you, specify a date (the “Liquidation Date”) for the termination and liquidation of Transactions in accordance with this clause. 3. we shall treat each cost or loss to us, determined as above, as a positive amount and each gain by us, so determined, as a negative amount and aggregate all of such amounts to produce a single, net positive or negative amount, denominated in the Base Currency (the “Liquidation Amount”). Unless required by Applicable Regulations, either party may terminate this Agreement (and the relationship between us) by giving ten days written notice of termination to the other. We may terminate this Agreement immediately if you fail to observe or perform any provision of this Agreement or in the event of your insolvency. In the event of termination, all Customers’ open positions shall be closed by the date of termination without derogating all the provisions aforementioned therein, including charges, fees and penalties. 2. Fivecircles Limited shall apply best execution rules in cases where you have not provided Fivecircles Limited with specific instructions regarding the closing of your positions. It shall be noted that Fivecircles Limited and any entity related to Fivecircles Limited, will perform Transactions in good faith and with proper due diligence but neither we nor our directors, officers, employees, or agents shall be liable for any losses, damages, costs or expenses, whether arising out of negligence, breach of contract, misrepresentation or otherwise, incurred or suffered by you under this Agreement (including any Transaction or where we have declined to enter into a proposed Transaction) unless such loss is a reasonably foreseeable consequence or arises directly from our or their respective gross negligence, willful default or fraud. In no circumstance, shall we have liability for losses suffered by you or any third party for any special or consequential damage, loss of profits, loss of goodwill or loss of business opportunity arising under or in connection with this Agreement, whether arising out of negligence, breach of contract, misrepresentation or otherwise. Nothing in this Agreement will limit our liability for death or personal injury resulting from our negligence. Fivecircles Limited will not be held liable for any lost opportunities by you that have resulted in either losses or reduction (or increase) in the value of your Financial Instruments. The levels we present on our site are the ones Fivecircles Limited is willing to sell options at, they are not the real time market levels. the assets offered by Fivecircles Limited and the way the Transactions’ expiration rates of indexes, stocks, currencies and commodities which are offered by Fivecircles Limited are calculated may change from time to time at Fivecircles Limited’s sole discretion. Customer undertakes to continuously ensure customer is updated on the assets and the manner of aforesaid calculation. Fivecircles Limited makes every effort to ensure that the Banks and institutions to which your funds and/or Financial Instruments are deposited are of good standing and reputation. However, Fivecircles Limited shall not be held liable in the event of a loss resulting from deterioration of the financial standing of a bank or institution, or for an event such as a liquidation, receivership or any other event that causes the Bank or institution of a failure and therefore leads to a loss of all or part of the funds deposited. You further acknowledge that you are responsible for reviewing the expiration dates for the options, which are located on the Company’s official website. We have the right to amend the terms of this Agreement. If we make any material change to this Agreement, we will give at least ten business days´ written notice to you. Such amendment will become effective on the date specified in the notice. Unless otherwise agreed, an amendment will not affect any outstanding order or Transaction or any legal rights or obligations which may already have arisen. We are obliged to establish and maintain internal procedures for handling complaints fairly and promptly. You may submit a complaint to us, for example by letter, telephone, email, or in person. We will send you a written acknowledgement of your complaint promptly following receipt, enclosing details of our complaints procedures, including when and how you may be able to refer your complaint to the Vanuatu Financial Services Commission (VFSC) which is the relevant regulatory body. Please contact us if you would like further details regarding our complaints procedures. This Agreement shall be governed by and construed in accordance with Vanuatu law. If you are situated outside Vanuatu, process by which any Proceedings in Vanuatu are begun may be served on you by being delivered to the address in Vanuatu nominated by you for this purpose. This does not affect our right to serve process in another manner permitted by law.